Beyond the Pistes - The Untold Stories of the Ski Patrol in La Clusaz, France. The Ski Patrol story is pretty much untold and we wanted to get to know these people, the real people and personalities who keep the mountain safe. They wake up everyday for sunrise. Catch first lifts. Ski first tracks. Live for the mountains. Live to ski. The guys & girls in the orange jackets have always been of intrigue to us, knowing they are a vital part of keeping the mountains safe but apart from seeing them skiing down the slopes with the rescue sledge never really knowing exactly what they do. After spending two weeks filming and photographing with the Ski Patrol team in La Clusaz we came away feeling overwhelmed with warmth from their kindness, inspired by their passion, blown away by their skill and in awe of their knowledge and love for the mountain. We’ve produced a short film ‘Beyond the Pistes’ that not only do we hope will give people an insight into the incredible work of the Ski Patrol but also a real insight into the people that do it. They are all true people of the mountains – no fear for the cold, the wilderness or the risks involved in the job. They work to feel alive, driven by their passion. Film documentary released 18th February 2019. 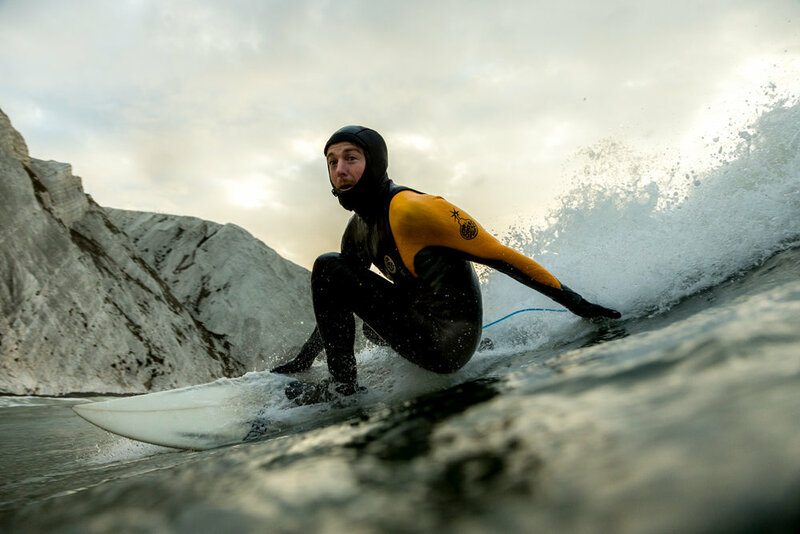 FOUNDER & DOP JAY HAYSEY SHARES HIS COLD WATER, EARLY MORNING ISLAND SURF ADVENTURE STORY - from November 2017. "I can't believe within half an hour I was out of bed & racing around the needles in a Zap Cat and submerged in the freezing cold ocean." Distinguished by its Jurassic coastline, its annual music festival, links with Royalty, garlic farming and apparently the most sunshine hours in the UK, the Isle of Wight is an amazing little place. Little do most people know that it see's some amazing swells and has some great hidden surf spots. The alarm was set for 5.30am, which in November meant still very dark and cold. Within minutes I was out of bed, straight into my wetsuit which I had laid out ready the night before and out the front door, slice of burnt toast in hand. I drove in convoy with my friend Jack to the beach where we had planned to meet the rest of the group. We jumped out of our cars as soon as we arrived and pulled on the rest of our wetsuits as quickly as we could, only speaking a few words in the early morning silence. Before I had the chance to put on my 5mm gloves we saw the Zap Cat appear on the horizon, and it was only seconds before we were swimming out to the boat and clambering in, it felt like some kind of army exercise. The dusky light, still and quiet at this time felt like the whole situation was a stealthy, undercover mission! It was so surreal heading towards the needles, the white cliffs soaring from the sea before the sun was even up. As we approached the bay we were all excited to see that there was swell, it was a new spot for everyone and therefore a complete surprise as to whether it would be working. The swell was rolling in and within minutes my gloves were finally on and I was in the ocean amongst the waves, camera in hand. As the sun came up and broke through the clouds the sea was illuminated with a yellow/orange glow and the white of the cliffs behind popped with colour against the blue sky. Once back on dry land and out of my neoprene all I could think is how much of an adventure we had had before 9am and that a lot of people's day's hadn't even begun and were probably enjoying a nice Saturday morning lie in. You can't beat the feeling you get when you start your day in that way and had definitely earnt my breakfast. When we set out to film Red Paddle Co's new 2018 collection, it was kind of a given that there would be a SUP adventure at the heart of it. Eight million tonnes of plastic are dumped into the ocean every year according to a recent study published in Science. If no action is taken there will be more plastic than fish by 2050.